We need books to scan, please send what you can. We need books to scan. See that widget over there on the upper right. It’s titled “IA BookDrive Book of the Week • Please Contribute Yours • openlibrary.org/bookdrive“. 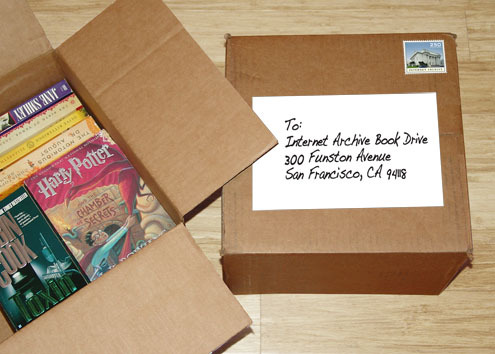 I’m going to be posting photos of books each week that we have received for the Internet Archive Book Drive. But we need more, lots more, which is where you come in. We’re covering the cost of scanning the first 10,000 books we receive. That’s 10 cents a page (I’ll let you do the math on your own books). They can be new or used, sent from you or from an online bookseller. (note: if you’re buying books to send please check on openlibrary.org to see if we’ve already scanned the work). You can send as many books as you like (if you have more than 100 please contact us about shipping). Bestsellers, fiction, non-fiction, reference, technical, paperback, hard cover, any subject, any genre…they’re all good. We need books to scan. Please send what you can. 3 Responses to We need books to scan, please send what you can. What about copyright laws? Are you in violation for those not in the public domain?